Tonight marks the beginning of another Premier League season. The same stories will be played out on the screen, but this year is different. I remember it like it was yesterday. I was sitting on the lounge room floor of our home in Biloela in Central Queensland, The Australian spread out in front of me. I happened across the Premier League table and asked my dad (who was on the computer behind me) who I should support, and instead of being given suggestions I was told we supported West Ham United and that was the end of it. In reality it was just the beginning. 1997 is a long time ago and the experiences West Ham have given me in the same period have shaped me into the person I am today. This season is different because it’s the last season at Upton Park. Since that fateful night in 1997 finding my way to Upton Park has always been in the top two of my sports bucket list. The reality of it is now it will never happen – I accept that. The move to the Olympic Stadium could do some wonderful things for the club, or it could backfire and ruin us and a lot of which way that goes depends on this season. I was against the move from day one because I want to see Upton Park and due to extenuating circumstances it was never a reality. The Olympic Stadium will be a great experience and I know I’ll get there one day. Stadium issues aside the build up to this season has left me feeling more optimistic than I care to remember. A new manager, an adventure into Europe and players we couldn’t have dreamed of buying five years ago, is this real life? One thing is for certain – I feel entitled as a West Ham fan and my optimism this year is to thank. When you think of a club like West Ham you don’t think of raging success. That’s why I feel entitled, because we’re on the move. Have your Liverpool, Man Utd, Chelsea, Arsenal and Man City*. 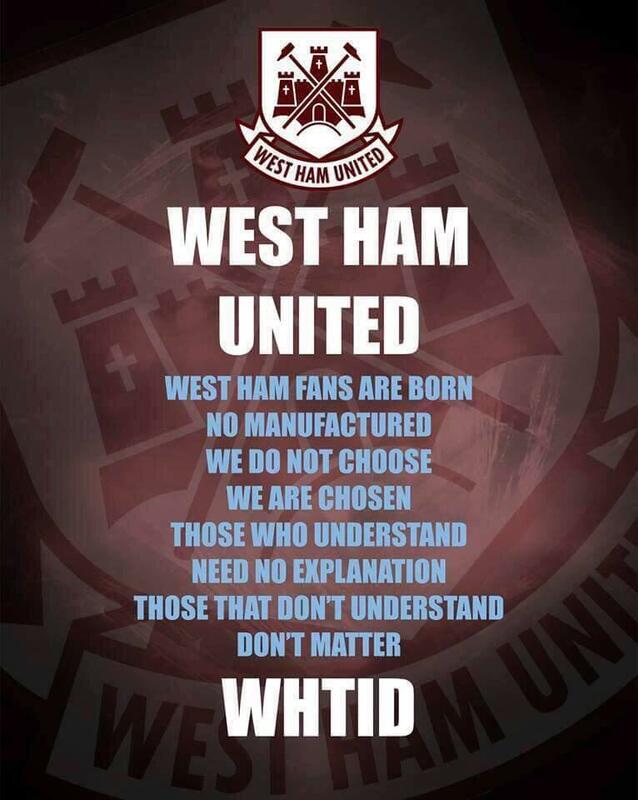 I’m West Ham and like it or hate it we’re the best club in the league. We’ve got all the things I listed above, we’re the only club to win the World Cup, last time I checked everybody bled claret and blue and we have the loudest fans in the league. Enjoy your trophies, I’ll take being beaten at Wrexham because I’m part of something bigger. That’s the thing about my dreams…. They fade and die. * – Two of my great mates have been Man City fans since the old Division Two days. I celebrate the success of Manchester City for those two only, and will continue to do so forever.